Exports rose by 9 per cent to $331 billion during the last fiscal and imports rose by 8.99 per cent to $507.44 billion. As a result, the trade deficit widened to $176.42 billion for the entire fiscal, compared to $162 billion in 2017-18, official data showed. 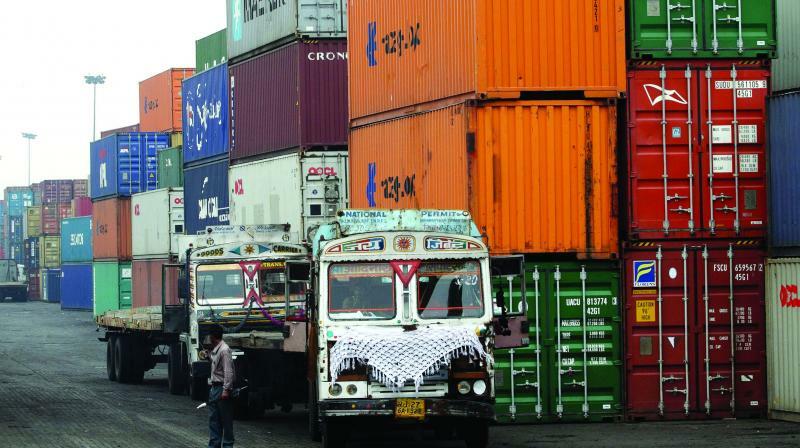 New Delhi: The country’s exports and imports rose at the same rate in fiscal year 2018-19, widening the trade deficit. Exports rose by 9 per cent to $331 billion during the last fiscal and imports rose by 8.99 per cent to $507.44 billion. As a result, the trade deficit widened to $176.42 billion for the entire fiscal, compared to $162 billion in 2017-18, official data showed. However, exports saw a significant rise in March, hitting a five-month high of 11 per cent on account of higher growth in pharma, chemicals and engineering sectors. Merchandise exports in March reached $32.55 billion against $29.32 billion in the same month in 2018. This was the best growth since October 2018, when shipments grew by 17.86 per cent. Imports rose by 1.44 per cent to $43.44 billion in March 2019, narrowing the trade deficit -- the difference between exports and imports -- to $10.89 billion for the month of March compared to $13.51 billion in March 2018. “Through secular growth over the last three financial years, following the major downturn in the face of the global slowdown, merchandise exports for 2018-19 are estimated at USD 331.02 billion, the highest ever, surpassing the earlier peak of USD 314.4 billion achieved in 2013-14. This has been achieved in a challenging global environment," the commerce ministry said in a statement.